Lohses in Stavanger: What a glorious day to get lost! We’ll cruise for about an hour to Helgøy where those who bring their bikes will debark. Onwards to Holmen where those who wish to walk will debark. We will then arrive at Sjerarnøy Maritim where we will debark and have about 1.5 hours to explore. At 13:45 we will be served lunch of grilled salmon, potato salad and dessert or pølse and soft drink. We’ll then depart at 14:45 for Stavanger. The bike ride is 40 mins and the walk is 20 mins. Somehow, we got lost (not just us, some of the other people too) ... and I'm about 99% sure that it was because we kept stopping to take pictures. So .... enjoy the pictures that we took when the bike ride took quite a bit longer than expected. We ended up just in time for lunch! Here we are, loading up the bikes for the trip. Ron was REALLY hoping this wasn't our boat. For some reason, he didn't like the name. And it wasn't. So all was good. Here are the bikes, all loaded up on the top of our boat. We arrive in Helgoy and meet our tour guide. And we start our bike ride. It's a short one, and we'll meet on the bridge so we can take pictures. Everyone is glad for the quick breather. The downhill parts are a LOT of fun. But we have to go uphill first before we get to them. I have to stop and take pictures of pretty flowers. And my husband patiently waits for me. It's time for another quick break and this is the LAST time we are together as a group until we meet for lunch. Yes, that means somehow some of us will now get lost. :) We meet at the Sjernarøy Kyrkje. Sjernaroey Kyrkje which showed pictures of the inside of the church and had some interesting information .... which will be translate (hopefully correctly) below. The Sjernarøy church is situated in the parish of Sjernarøy Tungenes province. It was built of wood in 1647. The church has conservation status protected by law. 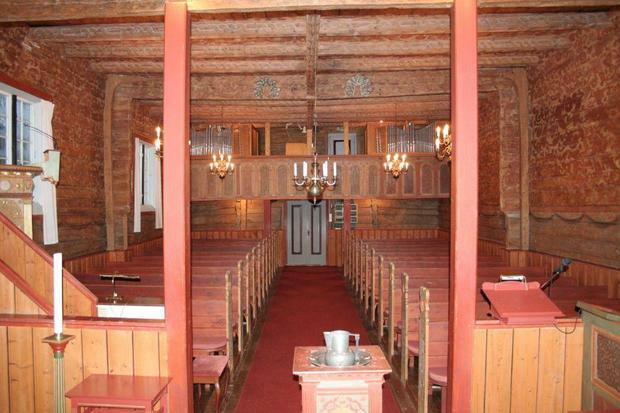 The year 1537 marks the end of the Middle Ages in Norway and the establishment of the Evangelical Lutheran State Church. The Black Death in 1349-1350 reduced the population by about two-thirds. Therefore there was almost no need for new churches before the population recovered in the 1600s. Since the cities still had a surplus of churches, many of which were solidly built in stone, it was primarily in rural areas that the new churches were erected. Of the 300 churches built in the first 150 years after the Reformation, are only 64 are left today. Most churches of this period were built of wood. Log technique replaced the pole structure. Liturgy shape changed, and the preaching was considered more important. This created a need for larger space with more closeness to the church choir and pulpit. Therefore they experimented with new plan forms, such as cross plan, Y-plane and 8-border level. Many of the stave churches were also expanded and had lower levels. The Reformed Church's stronger emphasis on the word and preaching also demanded a new type of decoration. Medieval side altars disappeared. The pulpit became more prominent and the rooms filled with benches. Many churches had galleries. The altarpiece, baptismal fonts and pulpits were decorated with biblical scenes and ornaments carved in deep relief. King's monogram was often a central position, since he was head of the Church. Right outside the church is an old stone house with its own stone potato cellar. Miss Kolie and I kept stopping to take pictures. Of silly things like cows with their own bathtubs. And poor Ron almost ran into me when I stopped REAL quick to take this picture. I have NO idea what this is, but I liked it! Just a big old stone something or other ... wish I knew the story. And really, is it any wonder we got lost with so many confusing signs? But we were not alone, so it was OK.
And lucky for us, we got there just in time to eat. After lunch we went and looked in the tank to see what had the kids so excited. All in all, it was a glorious day to get lost! Loved the pictures, the view you almost got creamed for, cow bathtub... We stayed in today since Mike is sick. It's a beautiful day here too! Great post!